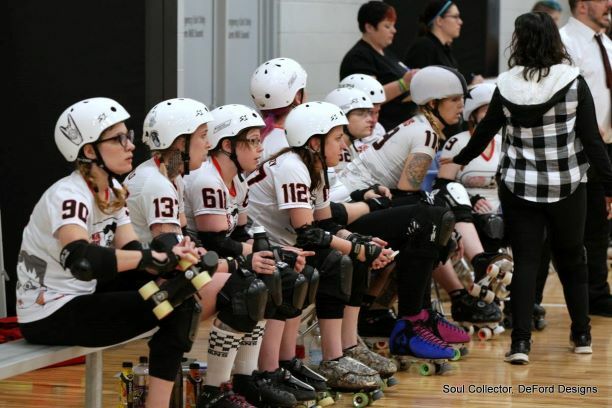 The Fort Wayne Derby Girls started the season off early on November 3rd by traveling to Grand Rapids Michigan taking on Grand Raggity Roller Derby Attack Team. Veteran skater Feline Frenzy led the high scoring jammer action with a single 23 point jam in the first half of the game. She put up a point total of 71 by the end of the night. Whittle also assisted with excellent jamming for a total of 44 points and this is her second season. Fort Wayne’s defense was strong with highlights and hard hits from Adkins, Sasquash-Ya, Lahapa, and Krazy Kat forcing the opposition into submission. Rennagade debuted as one of their newest move ups from junior derby with it being her first adult game and she was a power house on the track. Mostly playing in the pivot position she was also able to contribute 29 points to the scoreboard. This was a great start to the season for the team with a win of final score FWDG 223 to GRRD 100. The team is on the road this week to Muncie, Indiana to take on the Cornfed Derby Dames Misfits on Saturday February 9. FWDG is ready for our 2019 home game season to show our fans what we have been working hard on! Our partner junior league the Fort Wayne Derby Brats will be playing at 4pm each date. Home games this year are on February 23, March 9, March 23, and May 18 at the War Memorial Coliseum at 6pm.